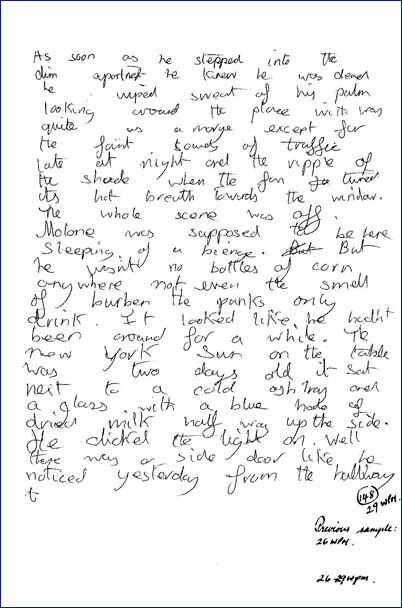 James, aged 14, from Leicester, had to work through a severe degree of dysgraphia with an allied hand tremor, and severe hand cramp. His written work was illegible. In addition he suffered from frequent headaches caused by SSS - scotopic sensitivity syndrome (light sensitivity). Therefore, reading and writing at length was not always achievable. He had, however, overcome most of his dyspraxic tendencies by the age of fourteen. It is a foregone conclusion that, with his specific combination of physical and visual difficulties, he would find it very difficult to concentrate and would experience an early onset of fatigue. All his teachers had recognised that James was bright and they were aware that his written work did not show his knowledge of their subject. It is not surprising that frustration caused many of his teachers to write adverse comments at the bottom of his school work, such as; lazy, you must make more effort - you have not written enough - careless work - you have not answered the question. All these comments caused frequent parental intervention on James' behalf because thay had witnessed at first hand how difficult it was for their son to complete a homework assignment. 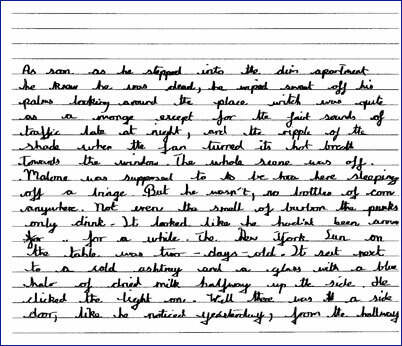 James is thrilled that his handwriting is easier, his hand cramp has gone, his writing is legible and he can now read his written work. He is a good reader, but needs to wear tinted lenses of a specific colour to counter glare problems caused by him looking at white pages (another fatigue factor). He will undertake a second programme for countering dysgraphia, a one, four-hour visit to improve the presentation and organisation of written English. This programme will also enable James to improve upon his predicted grades in GCSE examinations.